In previous posts, we’ve discussed choosing the right goat and preparing for the journey (part 1). We also discussed training our goats to walk on a collar, line, and halter, as well as how to drive with a halter and harness (part 2). In today’s post, we will be going over the final steps in training a working goat, cart training, weight training, and team driving. 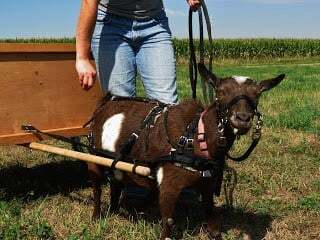 Now that your goat is successfully harness trained and is driving well on commands, you are ready to hitch him/her to a cart and begin cart training. Make sure you have an assistant present with you to help control the goat or hold down the cart if necessary. When hitching a goat for the first time, make sure you are using a completely empty cart. Weight will be built up later. Also, be sure to make it a positive experience the whole way through. Your goat will remember this experience EVERY time you hitch it to a cart. 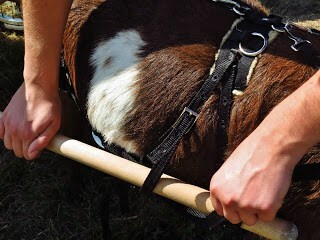 To hitch your goat to the cart, run the tugs through the shaft loops and attach to the back rings on the cart while sliding the shaft through the loop as well. Run the reins through the top loops on the back pad and take position behind the cart. DO NOT attempt to ride in the cart on the first drive. 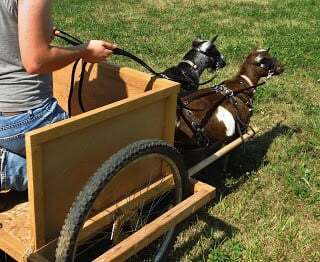 With your helper holding a leash attached to goat, and the driver ready behind the cart, give your goat the command to walk forward and begin basic maneuvers with the cart, stopping frequently to let the goat adjust to the feel of the cart as well as how to stop the cart. Take this step very slow. 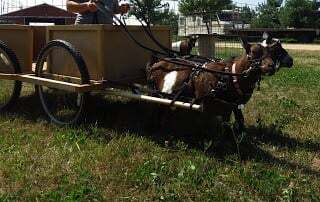 Do short training sessions until your goat is comfortable with the cart. This could take anywhere from 4-9 days. That last thing you want is a goat that is afraid of the cart. Once your goat is comfortable with the cart and will drive for you, you are ready for weight training. Before you can even attempt to ride in the cart (assuming your goat is big enough to pull you), you will want to begin weight training your goat to get him/her used to what pulling feels like. Weight rules generally follow this principle: Does = their own weight, males = twice their own weight. Remember that pulling weight is much different than lifting weight and often times you can pull more weight than you can carry, so these are just rough estimates. Only you will know how much your goat can pull based on their body language and strength. A goat that appears to be overly straining, falls over, or and won’t walk forward may have too much weight in the cart. Start out with a small amount of weight in your cart — about ½ the weight of your goat. Practice driving your goat with this weight for a few days and only when you feel your goat is ready, increase the weight slightly. You will know they are ready when they don ‘t strain to walk forward. Weight training for goats is very similar to weight training in humans. You need to take is slow and allow the muscles to adjust. This may take a few weeks, depending on how much weight you want your goat to pull and the strength of your goat. If you’ve reached your desired weight in training and have a goat that is suitable to pull you, you can begin training to ride. It is best to first have a person of equal or lesser weight to you ride in the cart as you drive. This will let the goat know what it’s like to have weight that can sometimes be unequal with movement. After a few trial runs, you can take your first ride as goat and driver. NOTE: A single miniature goat SHOULD NEVER try to pull a full grown human — you must have a team for this. Once you’ve taken your goat on a few successful rides, you are ready for the big time! 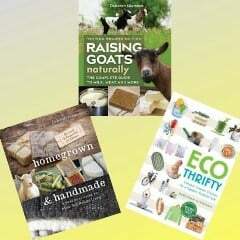 Take your goat out to fairs and parades — show off your hard work! You are now the proud owner of a working goat! Team driving is exciting, especially with miniatures who can’t pull much weight to begin with. This does require a different type of set-up on your cart to accommodate additional goats, but often times is not much work. To train a team on a cart, use two goats who are equally trained to pull on their own and hitch to your cart. Again, start with small weight and drive from behind. Have a helper up front to watch and maintain peace between goats if they start to become annoyed with the close company. Work the team together and gradually add weight until you are able to add real human weight. Again, PLEASE NOTE: take caution with miniatures goats. They may not be able to pull a full grown human at first or at all, depending on their own size and ability. It took a year of training before the does pictured here could pull a full grown human. If the goats work well together and progress with weight, you may enter cart and begin real team driving. And now you’ve got a goat trained to drive. For follow-up discussion and troubleshooting, please come back next time for Part 4. 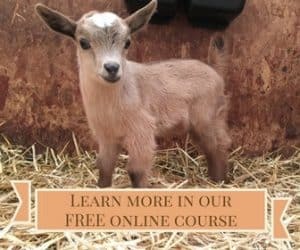 Continue reading about training your goat to be the next great working goat: Part 1: Your Journey Begins Here; Part 2: Beginning the Long Haul; and Part 4: What Now? Deb, can you label these four posts with a label like 'Training goats to Cart' so that I can bookmark the label and find all these posts easily in the future? PREEEETY PLEEEEEAAASE!? Deb, thanks for the tutorial on cart training! It’s fascinating how many animals can be trained to perform chores. I have never trained a goat, but I have trained horses to drive. I have a suggestion that horse trainers use which might ease the goat’s (and trainer’s! :0) transition from driving to actually being hitched to the cart. With a horse, hitching is the moment of truth. A large and very strong animal is now firmly attached to an frightening device. Horses are prone to panic and flee (dragging you along) or panic and kick your cart (or you) to pieces. You suggest having a helper at this stage. Have the helper pull the cart behind the animal while the trainer drives from the side. This allows the animal to become accustomed to this strange wheeled device that keeps following them around. Make sure to pull it over bumps so it rattles. Unfamiliar noises are part of the animals’s conditioning. After the animal calmly accepts the cart following them as harmless, THEN hitch them to it.